Granite, natural stone is for making Kitchen Platform counter top in kitchen. It is also used for window frames and door frames. Indian kitchen involves lot of spices and oil. Granite has high resistance towards such acidic and alkaline solutions. Inside window frames and doors frames, Granite has replaced wood, since wood has become costly and Granite is more sturdier then low quality wood. 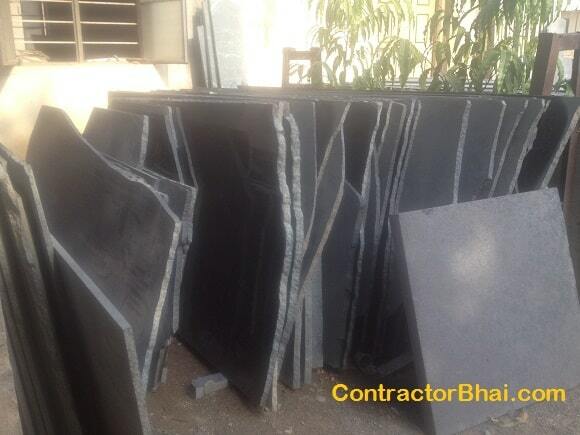 Granite stones available in India come from mines in Southern India or Rajasthan. There are different types of granite, but south granite is the hard, strong, most durable and best granite of all. While buying granite look that there are no cracks or it is not chipped from anywhere in the piece. Granite cannot be re- polished like marble, there look for polished granite while buying. Test for it porosity. Do this by sprinkling few drops of water on granite, let it sit for 15 minutes. Wipe the water with clean napkin or paper towel. If there are any deposits/ remains left than the granite is highly porous. Such a stone is not a good choice as far as water absorption is concerned. Test for its acidic resistance. Do this by letting a lemon slice on its sides of the sample stone overnight. If you see patches or the polish/shine has been affected, then that granite stone is not a durable piece. Check the thickness of the entire slab you buying. The stone shall be uniformly thick. Granite is available in variety of color, but black is the most preferred for kitchen counter tops and window sills. Look for natural black granite stone. These days granite is dyed to black to give it a rich look. To check for this, apply a nail polish remover or acetone on a cloth and rub on granite. If the black colour comes off on the cloth, then it has been dyed.